The Mapple Height Top Powder claims it’s the “rapid body growth” solution to increase height. Yes, it’s the powder form and I also actually found the Zoom Height Gainer bucket as well. It’s basically like 2 big containers of “protein” shake to add scoops and mix it up to drink. 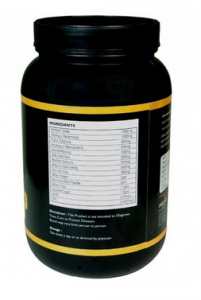 However, we have done a review on some other Mapple Height Top Powder, but this black bottle is completely different. The reason why I’m about to do a review on both Mapple Ayurvedic Height Top Powder together with Zoom The Height Gainer because there isn’t much information about each one. That way, I figured I’ll investigate and collect every data to show you if it’s your best choice or not. All you have to do is read on and you should get to know everything. Mapple Height Top Powder is from the company called (Mapple Overseas), who claims it’s GMP certified manufacture where they produce all types of forms from pills, powder, creams, etc for over 2 decades in the industry. Yet, they develop Ayurvedic products as well, such as the Mapple Ayurvedic Height Top Powder promoting to gain inches in height. 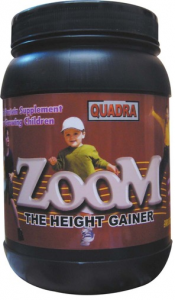 Now Zoom The Height Gainer is manufactured by the (Quadra Nutritions Ltd). These both companies are out there in North India country. The Mapple Ayurvedic Height Top Powder have 3 types of flavors, the American Ice Cream, Vanilla or Chocolate, plus you can choose the size of the container, such as 300g, 600g or 1kg. But the Zoom Height Gainer comes in only Chocolate flavor. They both claim to be 100% safe and should cause no harmful side effects, but only gains of height growth. Yes, completely natural as well. 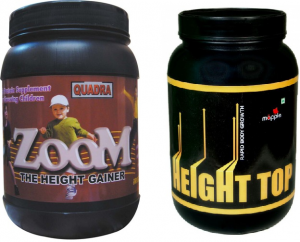 Both powder formulas promote as a height gainer to increase the height of each user/individual. Zoom The Height Gainer is for “youths and children” to help boost up the potential growth in stature, so I’m assuming adults like me with the growth plates closed shouldn’t give this item a shot!? Now the Mapple Ayurvedic Height Top Powder has more information and it claims its for folks of all ages, which they mention that “even after growth of height ceases at a certain age“. This product also states to increase bone density and promotes calcium growth, and general health as well, such as strengthen the immune system. It promotes to improve our personality, memory power, and vitality. Claims to make us more energetic and active throughout the daily basis, and that way, it improves concentration. Mapple Ayurvedic Height Top Powder shares to stimulate the pituitary gland to release the secretion of hormones called (Human Growth Hormone). According to them, the production of HGH levels is what causes height growth in all users, which the ingredients should cause the development of bone density. With Zoom The Height Gainer, it does have compounds to increase Human Growth Hormone as well, and they offer to only show the amino acids called L arginine, L-Lysine, L Ornithine and with some herbal extracts such as Chandrasur, and Mucune Prurience. And the Mapple Height Top Powder, we were only able to zoom in at the bottle’s label and see what ingredient’s profile, which I couldn’t see it clearly, but some are Aspargas Racemosus, Orchid Mascula, Sida Cordrolia, Whey Protein, Skimmed Milk Powder, M.P.S, PPS, and several others. Yes, they both are 100% vegetarian! As they explain, it wants us to take 10-15 grams three times a day with milk or water, then stir it well to drink it, and for the Zoom Height Gainer, it failed to share on the intake process. No prescription portion would be necessary to order the products since it should be completely safe. Now to order either one of the powders? I check out for the Mapple Ayurvedic Height Top Powder, and they only accept in Indian money, which I’m assuming that it’s only available in India country and not for folks out here in the United States or any other country. And for Zoom The Height Gainer, you would have to click “send a response” and they should get back via email within a few hours. When I clicked on the (Return) tab, it only showed me a form to file a ticket to return the product for any money back guarantee. If I were ever to grab an order of any of these powder methods, I would make sure they have any type of money back guarantee, because if you gain no height growth results, than you will be allowed to send it back for a refund. The shipping process, they accept cash on the delivery spot! So here’s my thoughts and opinion! While reviewing both products, the Mapple Ayurvedic Height Top Powder formula does seem like a “quality” supplement, since it was produced in a certified GMP manufacturer. But after I looked over at the full list of compounds, I don’t know if it can really cause height growth of inches. In fact, there is nothing that could make me believe it will have the potential to increase my stature. Both of them failed to show any form of data/structure and prove it that it’s an effective powder formula, there is nothing from medical endorsements, plus no reviews for any testimonials or any before-and-after pictures. The Zoom Height Gainer chocolate formula shows nothing, but only a picture and 4-5 sentences of information only. Yet, they both are probably not available in to send it all the way to here in the United States/Canada region. Now which one is better, you ask me? I mean, the Mapple Ayurvedic Height Top Powder might be a better choice in my opinion, maybe though ! Because, the ingredient’s profile does not show any type of amino acids to really increase more HGH levels. It would be a slightly hard decision, or maybe I would personally go for something else, where I would have more faith in the product. Perhaps, I would rather take some effective pills with the right amount of ingredients and just pop a pill or 2, than expect to increase height. 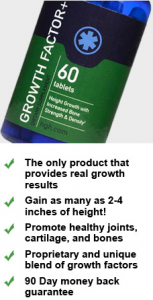 Which, I have actually done a number of reviews on “grow taller pills” and it was only one that was found with proof of evidence that real users gained growth of inches. Growth Factor Plus is more of a “professional” product with several reviews found from users’ before and after results. Head over to my review and you’ll get to know all about these effective pills in today’s industry. Have you got a chance to use any of these powder formulas? If so, let us know your experience and if you have any opinions or thoughts, write me below in the review. Don’t hesitate to drop me anything you want! Height Top Capsules Review – Does Height Top Capsules Work? Here’s The Reviews!